With most families on a tight budget, parents are sometimes not able to spring for the cost of a huge wedding. Therefore, couples are looking for ways to cut corners and reduce costs without sacrificing style. Though obviously you will have to pay some vendors, there are several simple things you can do yourself to scale back the cost of your wedding. Follow these D-I-Y wedding tips and enjoy your wedding day without going into debt. This is the easiest place to save money. 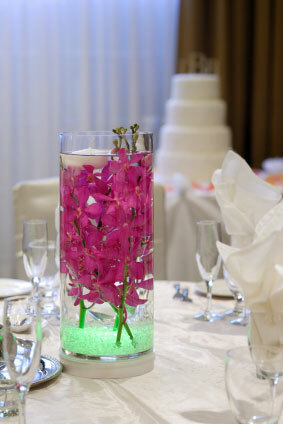 Don't pay a flower shop to create your wedding centerpieces and other reception decorations. For a quick, beautiful D-I-Y centerpiece, head to your local dollar store or craft shop instead. By a selection of clear bowls or glasses and place colorful glass marbles or aquarium rocks in the bottom. Fill the bowls halfway up with water, then place floating tea light candles in the water. Tealights cost just a few cents each. If you don't want candles, you can float the buds of flowers in the water instead. At your grocery, flower or gardening store, you can get daisies and other cheap flowers in bulk at a very low cost. The biggest bonus is that you will have a set of bowls or glasses to keep long after your wedding day. From your wedding invitations to the ceremony programs to anything else you need printed for your wedding can by done yourself. 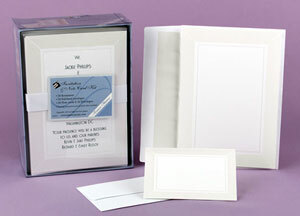 D-I-Y wedding invitations are as beautiful as the traditional type, while costing a fraction of the price. Do you have a friend or family member who is a wonderful baker? Instead of paying hundreds or even thousands of dollars to a wedding cake designer, enlist their help. 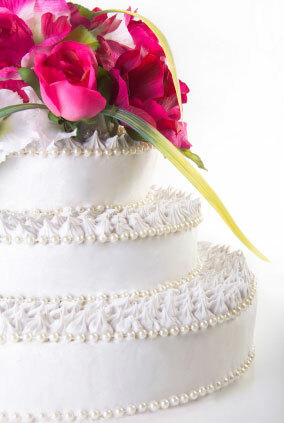 Your Aunt Sue can bake and decorate your wedding cake for you in lieu of a gift. Catering is oftentimes the biggest expense at a wedding reception. There are plenty of alternatives to a fancy, sit-down catered dinner. Things to consider are a lunchtime reception (food is often half price in the day), a dessert-only reception, or even a good old fashioned pot luck. Also don't forget about the bar. Premium liquor flowing all night can put a big dent in your budget. Instead, serve a signature drink, wine and beer only, or just house liquors.